Ginger is one of my very favourite flavours to use when baking. But it’s important to remember that it’s an ingredient that comes in many varieties. 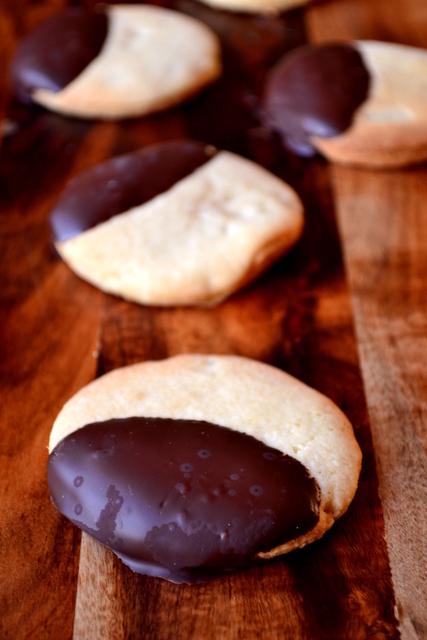 These Dark Chocolate Ginger Biscuits for instance have a subtle, sweet ginger flavour. On the flip side, my recipe for ginger nuts is far more powerful and full of spice. The difference is in the ginger used – stem ginger is mellow; root or ginger powder is more robust. When making these biscuits, the size of the stem ginger is all important. Stem ginger is soft and sweet, so it’s best kept in fairly large chunks to maximise impact. By keeping the ginger in discernible pieces you’re helping emphasise it’s relationship with the bitter chocolate, improving the overall biscuit-eating experience. Using a good quality dark chocolate of around 60% cocoa solids is also key. Doing so provides a wonderful contrast in taste between the sweet, muted-spiciness of the ginger and the bitter, rich chocolate. Of course, there’s nothing to stop you using a less bitter chocolate, or even milk chocolate if that’s your preference. However, by doing so you’d be relegating an important aspect of these ginger biscuits to the sidelines. In a large bowl, cream the butter and sugar until light and fluffy. Beat in the egg until fully incorporated and then fold in the flour, baking powder and roughly chopped stem ginger. Bring the mixture together into a firm dough, wrap in clingfilm and refrigerate for an hour. Remove the dough from the fridge, flatten and roll into a 5mm thick sheet. Preheat the oven to 190C/170C(fan). Cut the flattened dough into discs of 5-6cm. Pop them on to a baking tray lined with baking parchment and bake for 12-15 minutes until golden brown. 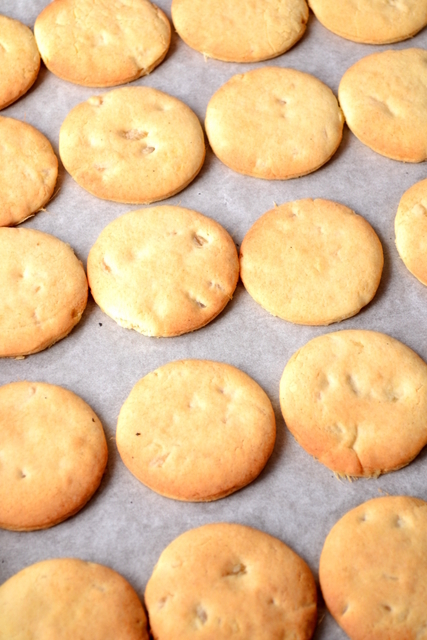 Leave the biscuits to cool for 2-3 minutes before transferring them to a wire rack and allowing to cool entirely. Once the biscuits have cooled, gently melt the dark chocolate over a bain marie. Dip each of the ginger biscuits into the molten chocolate until about ⅓ covered. 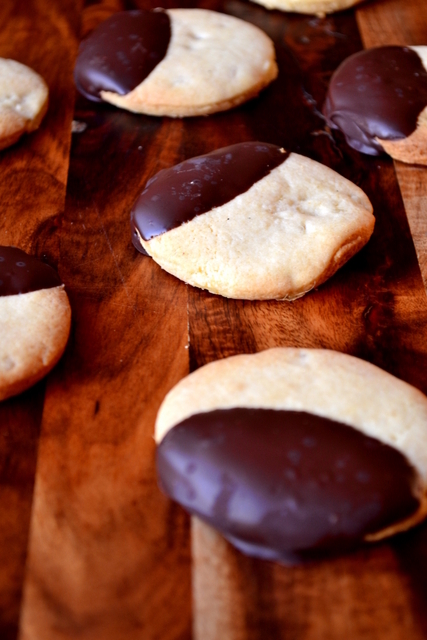 Once dipped, return each biscuit to a cool, flat surface. They can be eaten once the chocolate has cooled and solidified. 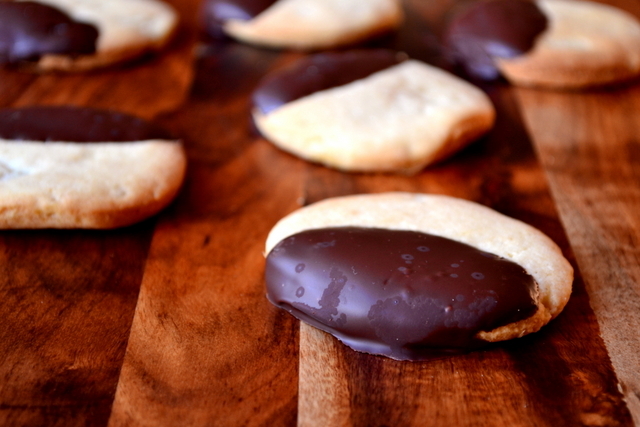 Cost: Biscuits, even jazzed up with a little ginger and chocolate, are almost always relatively inexpensive to make. Indeed, not to be seen as an exception to this rule, this recipe for dark chocolate ginger biscuits should set you back no more than £2. That’s a snip at 8-10p per biscuit! These sound delicious! I love anything with ginger, and it has chocolate too?! Yes please. But could you define the measurement on the ginger? I am unfamiliar with that term, and would like to be certain I am putting in the correct amount. Thank you. Does your stem ginger not come in a ball shape? They are about an inch each in diameter – don’t have any to hand to weigh them I’m afraid. These. look. lovely. Like the perfect afternoon biscuit for some tea! Love the use of stem ginger. So tasty with the dark chocolate. She has good taste! Pear gazpacho? Thanks for the tip… I hate cucumber anyway… Hope she enjoys university – I finished a couple of years ago and it was great. oh gawd these look so perfect!